Say the words "protective dog" to most companion animal veterinary practitioners, and most will know exactly what that means. Say “protective dog” to people outside the profession, and they will react the same way. The problem is that all these people may feel so sure of their definition that it never dawns on them that others may not share it. In reality, the mental images those two words elicit may vary a great deal. Moreover, this image has changed as a function of human and canine time and place. Holmes stated a fact that Conan Doyle’s readers would understand at a time when few pet dogs existed: The protective dog didn’t bark because whoever stole the horse was familiar to the dog. At that time most dogs were working dogs and savvy farmers and herdsmen prized — and still prize — dogs who only barked when it mattered. In those environments, excessively barky dogs could endanger instead of protect the animals and property. And responding to these dogs false alarms would waste their owners’ time. However, consider the case of Ms. Singleton and her pet dog Bruno. She and her then-spouse moved into her current home as newlyweds more than 40 years ago. Since then, the couple has divorced and their children have grown up and moved out of the area. Although Ms. Singleton likes her house and has many friends, the increased crimes related to opioid abuse in her city concern her. When she mentions this to a friend, the friend suggests that she get a dog. "I’ve read that dogs are great crime-deterrents," her friend reports. Her friend’s suggestion elicits memories of all the wonderful times Ms. Singleton and her family shared with their golden retriever when the children were young. Fueled by these memories as well as images of her new dog protecting her, she decides to get a golden retriever puppy. When Ms. Singleton visits a local breeder’s litter, she tells him she wants loud, barky dog who will protect her. Although the breeder suggests that a quieter, more stable animal would be a better choice, Ms. Singleton remains adamant; she wants the most vocal puppy he has. She names the new puppy Bruno and gives him treats and enthusiastically praises whenever he barks. It never occurs to her that doing so reinforces her naturally more subordinate puppy’s fears. During Bruno’s first visit to the veterinary clinic, Dr. Friendly notices his excessive barking. Seeing this as a harbinger of future problems, she mentioned this to Ms. Singleton. When the client beams proudly and happily agrees, the veterinarian decides to let it go. After all, aside from being somewhat edgy and pushy, the puppy was fine with Dr. Friendly once she gave him a few treats. However, a year later the practitioner regrets this when Bruno barks aggressively and lunges when she reaches out to pet him. "Oh, I’m so sorry!" exclaims Ms. Singleton, but then adds proudly, "Bruno’s very protective." Such problems are difficult to resolve because clients like Ms. Singleton have the dogs they want. She believes Bruno’s fear-based barking signals his willingness to protect her. If the veterinarian or anyone else questions Bruno’s motivation, she offers what she considers irrefutable proof. Since she got him, no break-ins have occurred in her neighborhood and, aside from when he awakens her with his barking, she now sleeps soundly at night. If anyone points out that, despite increased break-ins in her city, none ever occurred in her neighborhood, she dismisses this as irrelevant. Several changes may force these clients to rethink their approach. A common one involves visits from animal control or police officers in response to neighbors’ complaints about the dog’s behavior. Equally common is owner realization that their dogs’ behavior is socially isolating them. The same aggressive canine displays that make potentially threatening people stay away from Ms. Singleton’s home keep her friends away, too. Other times, changes in the owner’s living arrangements make the dog’s protective displays suddenly problematic. When Ms. Singleton’s son is deployed overseas, she wants to invite his wife and young children stay with her until he returns. But even if her son and his wife would accept such an arrangement, her great love for her grandchildren causes her to recognize a reality she previously denied: Bruno could pose a danger to all the family. Similarly, the arrival of a potential significant other these owners want to invite into their homes may cause fear-based, aggressive dog enablers to see their protective dogs more objectively. Their perception of their dogs’ behavior also may change dramatically when their dogs refuse to allow service people, emergency personnel, or home healthcare professionals into their homes. Unfortunately, when such situations arise, the same impetuosity that leads these people to reinforce negative behaviors now may lead them to seek immediate resolution of those behaviors. Those who can afford it or are on behavioral drugs themselves may want medication that will achieve this miracle. These can be difficult clients to work with, because they’re disinterested in pre-medication screening tests to ensure any drugs don’t cause more problems than they address. Nor do they desire to address the underlying cause of the problem, i.e. a human-canine bond that physiologically supports the fear-based canine behavior. Further complicating matters, some of these folks’ dogged insistence on drugs may raise concerns regarding possible client drug-addiction problems. Some who opt for other training approaches also may seek immediate results. It these don’t occur, they jump to a different approach. Once again, if the underlying cause of the problem isn’t simultaneously addressed, any positive results may be inconsistent or short-lived at best. A smaller group of owners will opt for punishment-based training. Sadly, many of those for whom rewards didn’t work will switch to punishment, too. In all these cases, if results aren’t forthcoming fast enough, the owners may give up or euthanize their dogs. That’s the bad news. 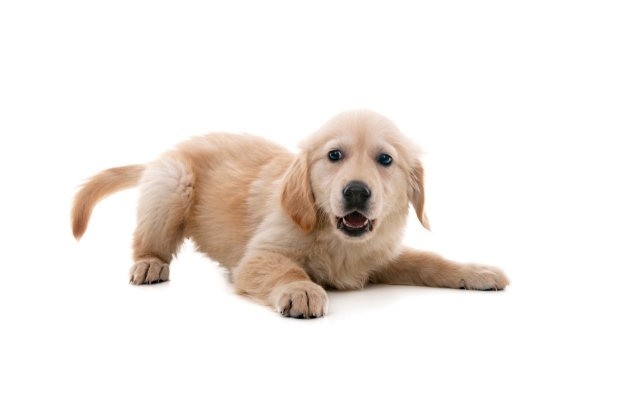 But these dogs also remind veterinarians to educate new puppy owners regarding fear-based vs. protective behaviors, as well as medical issues from the get-go. Practitioners and their staffs also should think twice before giving treats to fearful animals to facilitate their own work lest it literally comes back to bite them.